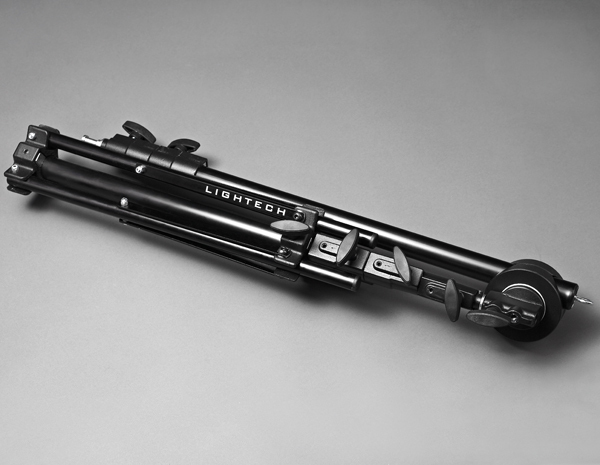 The Lightech Full Boom 450 is a compact boom arm when folded but big enough when in use. The idea behind the design of this boom follows the same principle as the Big Nano of folding as small as possible. It comes packed with its bag for storage and transport. As for how it compares to the Big Nano: the Full Boom is bit more substantial, the tubing is a bit wider and thicker in diameter all around and the foot print diameter is also larger. Folded down, this boom arm is only 80cm long (31.46 inches). You have to detach the boom arm from the stand to store it in the bag. As its name implies, the Full Boom 450 goes up to 4.50 meters (14.76 feet) in height. It can withstand Lightech’s 1.8 meter octabank although their version of this modifier is much, much lighter than other manufacturers’. 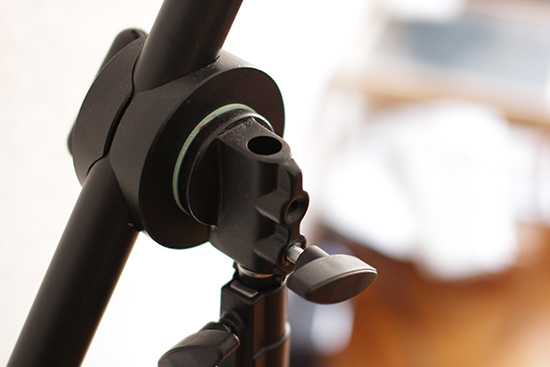 Keep in mind this boom arm is designed for lightweight modifiers and small heads. Though it is sturdy I wouldn’t want to test what would happen with another brand’s 1.8 meter octabank. I have had this gear for quite some time buuuuuut, as always I decided to do a stress test. I left their 180 octabank with a small studio flash head on this boom for 1 month, it wouldn’t budge even an inch, then I armed and disarmed it for 2 weeks 2 times a day for another month, brought it with me to work to use it and the boom still works like new. As you can see, like the big Nano, you have to mount the boom arm on the stand. 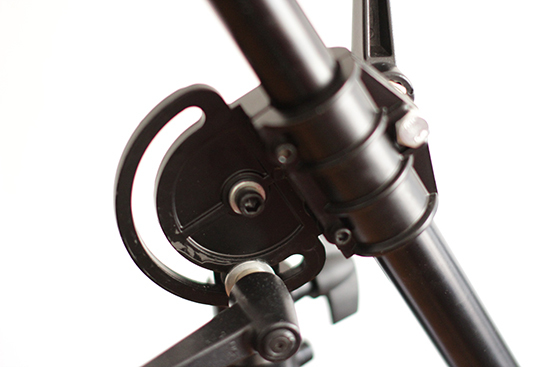 The mechanism holding the arm to the lightstand is nice and solid, however it is the kind that you need to release the grip holding the arm to tilt it up or down (keep that in mind). This part like the rest of the boom arm is pretty strong and solid. However to tilt the arm up and down you need to loosen the part that holds it together. To be fair only once has the tube slid a bit but this can happen and it is something to keep in mind. It isn’t like it is going to slide out, full force, but be careful. I liked the Big Nano — it is neat — but if I had to choose between the BN and the Full Boom I would choose the Full Boom without a doubt. It is sturdy enough for what it is designed (nothing rattles, nor is it wobbly), it is really solid and packs small when folded down. I like the fact that it comes with a bag to transport it (most manufacturers don’t even bother at all, you are at your own luck finding lightstand bags). 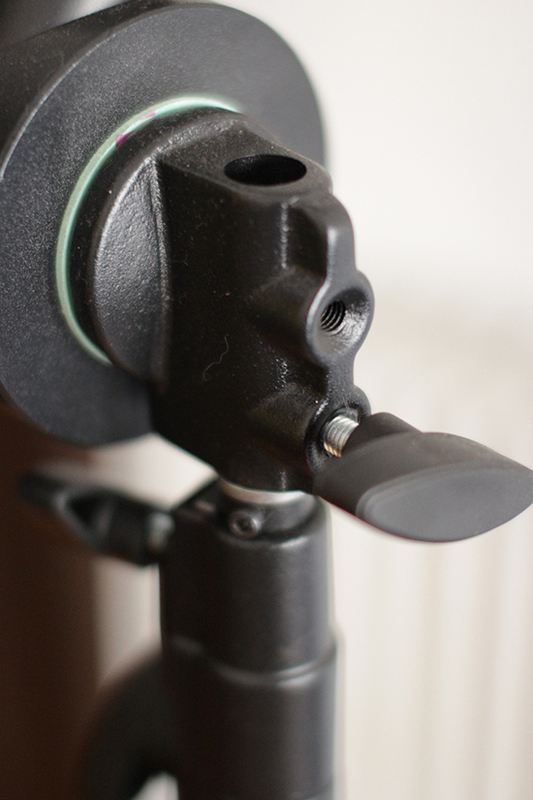 As for the rest, keep in mind this is a heavy-duty stand designed for small and/or lightweight modifiers; it is not intended to be used with heavy octas. (The secret to the weight to Lighttech’s octas and softboxes low weight is that the rods are kinda hollow, but more on that in their respective review). And being totally open about it, I freaking love it! You can see this product and more at Lightech’s website.